Find out that God sees each one of us as a priceless treasure and will supernaturally intervene in our lives. 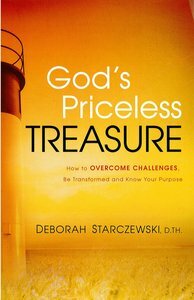 Author Deborah Starczewski shares through personal experience and inspiring stories just how miraculous God's intervention can be. She encourages you to seek God for yourself as she shares her wisdom and insight into the heart of God. These life experiences of redemption and restoration give hope to all. Proper communication is like the oil in your car that keeps it running smoothly. Without oil, the car begins to knock and make noises that let you know you have a problem. Would you ignore the warning light in your car that indicates your engine needs checking? I can assure you if you do, it will eventually &"blow&" the engine! Neither should we ignore the warning signs of improper communication that lead to conflict. We all know there is no marriage or relationship without conflict. Most know from experience that conflict can produce stress if not properly dealt with. Any relationship or marriage without any conflict would be quite boring, to say the least, and not much fun at all. Without knowing how to communicate properly, there will be a deep lack of intimate conversation and sincerity in marriage. Such a marriage might as well be a roommate situation where people are just going through the motions, and therefore are reluctant or afraid to express their individual dreams, desires, personal feelings, goals, personality, or own spiritual giftedness.